(January 4, 2016 — Washington, DC) Starting the New Year off in a generous fashion, People of Philanthropy (P.O.P.) 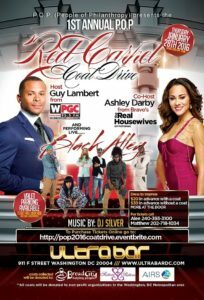 presents their first Red Carpet Coat Drive on January 28th at Ultra Bar, located at 911 F ST NW, Washington, DC 20004. P.O.P.’s goal is to collect 1,000 coats that will be distributed to three nonprofit organizations located in the Washington, DC, metropolitan area: Sisters4Sisters, Inc., Bread for the City, and AIRS, Inc.
“During wintertime, a warm coat can be a lifesaver, so we are especially grateful for this coat drive to benefit our neighbors in need. We also appreciate the opportunity to partner with organizations like P.O.P. who share our vision of Washington, DC, as a nurturing community, where all residents have access to the resources they need for survival, growth, and prosperity,” said Alicia Jackson, program assistant for Bread for the City, a program that provides vulnerable residents of Washington, DC, with food, clothing, medical care, and legal and social services. Relations, founded P.O.P. in 2015. “We have been successful and incredibly blessed in our respective fields and want to pay it forward by performing charitable acts throughout the Washington, DC, metropolitan area and beyond,” Brandon said. Guy Lambert, news director at 95.5 FM, will host the event with Ashley Darby, reality TV star from Bravo’s Real Housewives of Potomac. This star-studded occasion includes live entertainment from popular Washington, DC, cover band Black Alley. Sisters4sisters Inc. is dedicated to the empowerment of women and girls in mind, body, and spirit through personal and professional development. This organization engages the community through outreach efforts in the areas of HIV/AIDS, domestic violence, homelessness, and the mentoring of young women. Doors open at 7 p.m. Admission is $20 with a coat in advance. For more information about purchasing tickets, please visit eventbrite Contact Matthew Brandon at 202-718-1034 or Alee Opuiyo at 240-393-3100 for tickets or any questions about the event.